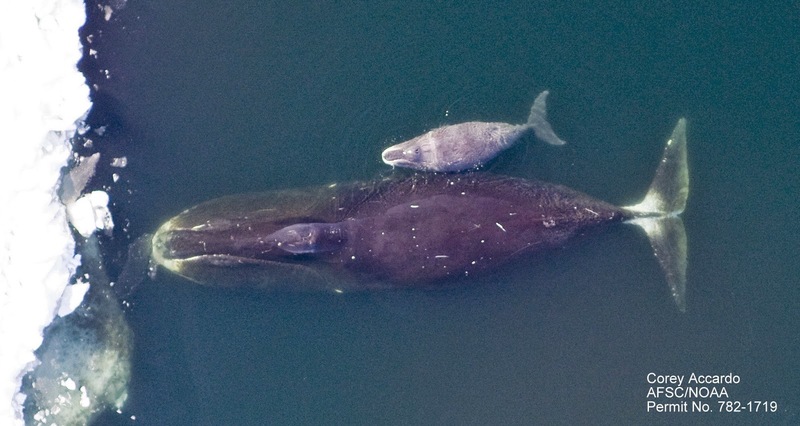 Well, Cape Cod Bay is in the news again and this time it's because the Center for Coastal Studies (CCS) researchers reported a rare sighting: a bowhead whale! According to CCS observers the whale was skim feeding in a group of right whales. Bowheads, like right whales, are filter feeders and eat zooplankton; Cape Cod Bay is rich with zooplankton at this time of year so this whale found a good place to stock up! A bowhead whale and calf in the Arctic. Bowheads are typically found only in the Arctic, and they are the bigger, beefier cousins of right whales. They can reach 60 ft in length, their blubber is nearly 2 ft thick (to protect them from the icy waters of the Arctic), and they use their massive heads (a third of their body length) to break through the ice. Their baleen is similar to that of right whales except twice as long, reaching up to 14ft!! But one of the most amazing things about bowheads is that there is evidence that they live to be well over 100 years old! 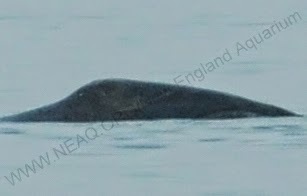 As unusual as this recent sighting is, it's actually not the first time this particular bowhead whale has visited Cape Cod Bay. Based on some unique scarring, CCS has confirmed that this is the same individual photographed by their aerial survey team back in March 2012. 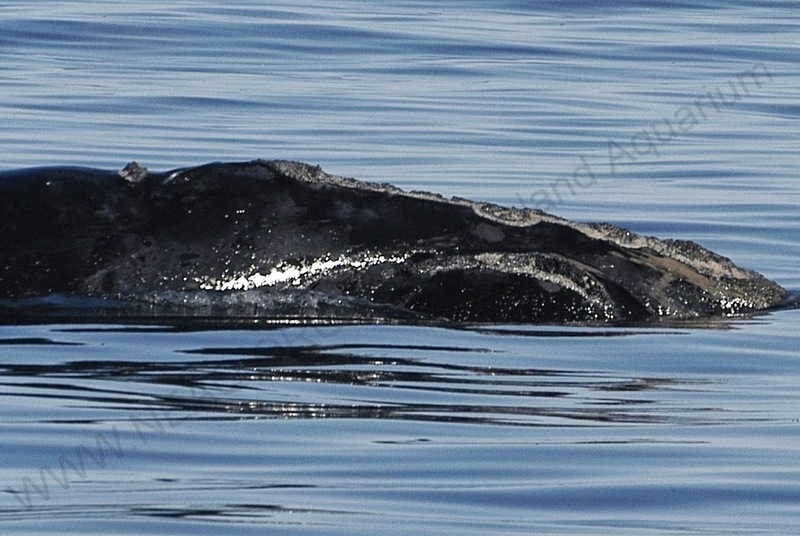 Later that year, the Aquarium's Right Whale Team sighted the same bowhead up in the Bay of Fundy! No one reported seeing it in 2013, so where it went in the interim is anyone's guess. Bowhead whales (top) are larger, Arctic relatives of right whales (bottom). Their heads are more strongly arched and they lack the distinctive callosities of right whales. There has been much speculation as to whether this lonely, wandering bowhead is from the Eastern Arctic population, or whether it could have traversed the Northwest Passage and be from the Western Arctic. At this point we don’t know anything about its origin except that it’s a long way from home. It's been a bumpy transition from winter, but solid signs of spring are finally here: geese have been spotted flying northward, crocuses are popping out of the ground, and right whales are feeding in Cape Cod Bay! The Bay has recently been hosting our beloved creatures as it does every spring, and it will continue to do so for several more weeks as the feeding season moves into full swing. Right whales feasting on abundant concentrations of tiny copepods can be seen skimming the surface as they filter their prey from the water. About the size of a grain of rice, this is what copepods look like to the human eye. This sample was collected by our team in the Bay of Fundy, a summer feeding habitat. How do they achieve this? Baleen! These long plates of keratin hang down from the roof of the mouth. While the outside of the baleen looks smooth and orderly, the inside looks more like matted hair—a net that traps those copepods so they can get gobbled up. Many lucky people will get to see these whales in action—while watching from the shore! To help protect these endangered whales, laws exist to make it illegal to approach a right whale within 500 yards, so watching from the shoreline is the best way for humans to observe these hungry whales. Please remember that if you, your family or friends are on a boat in Cape Cod Bay this spring, watch out for whales and slow down!! These creatures can be difficult to see and don't move very fast. Collisions with vessels cause severe injuries to whales, but can also damage boats and harm people on board. Watching from a distance can make you miss some details though, so I thought some up-close and personal footage of skim feeding right whales would be appropriate. Knowledge of what you're witnessing makes this an even more amazing phenomenon, don't you agree?! the New England Aquarium Right Whale Research Team. Want to learn more about these amazing, critically-endangered animals? Here are some right whale visitors to Cape Cod Bay from 2011. See what a recent survey season was like on the Bay of Fundy. Learn about some of the threats right whales face in the wild ocean. Meet some of the newest members of this small, special population. Here's an important success story about right whale protection regarding ship speed limits. These kids made a video about right whales and even supported this important research with a hefty donation! If you're interested in supporting this important research, consider sponsoring a right whale! Meet the whales and find out how your donation can help right whale research. North Atlantic right whales are endangered. To protect this species, IT IS ILLEGAL for vessels/humans to approach a North Atlantic right whale within 500 yards while in U.S. waters. If you see a right whale, please report it to NOAA at 978-585-8473. 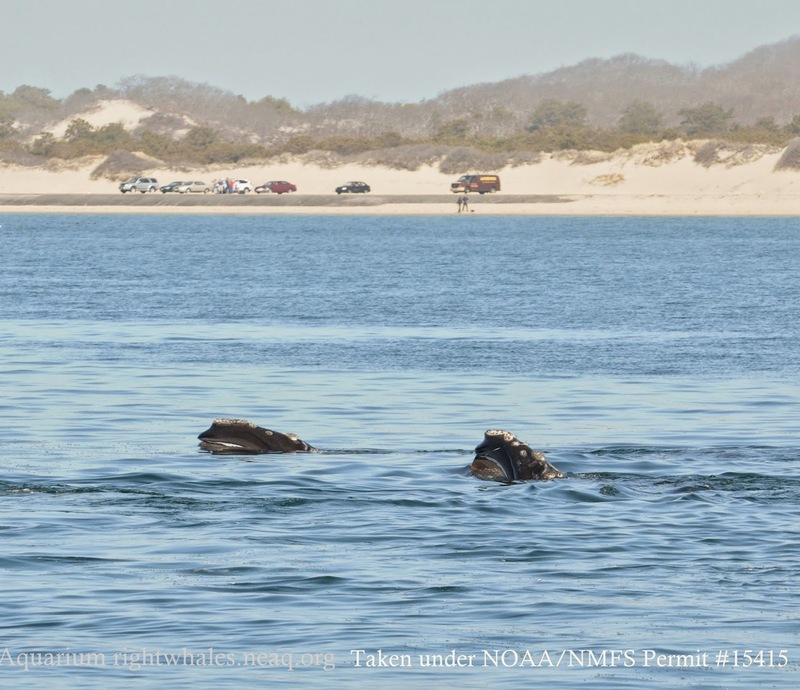 Injured, dead or entangled right whales should be immediately reported to NOAA at 1-866-755-NOAA (6622), or please call the USCG on VHF channel 16.